Our art school strongly supports our students participation in art exhibitions, shows and contests. Our students receive encouraging feedback and rewards for art work that they exhibit. 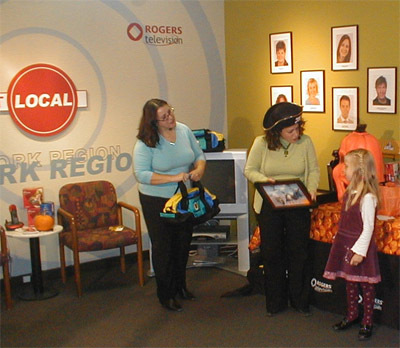 As part of the annual Rogers Pumpkin Patrol program, Rogers TV invites kids to enter their Howl-O-Ween Drawing Contest! Alecia, 6 years old, had submitted her painting and won the main prize in the age category 5 – 6. 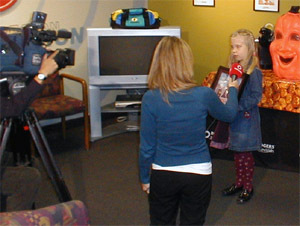 She had the opportunity to be a guest on Rogers Television, had pizza together with other kids and took home a Rogers backpack full of goodies. It was a very happy day for Alecia.